This is not a restaurant review - I leave those to the professionals! 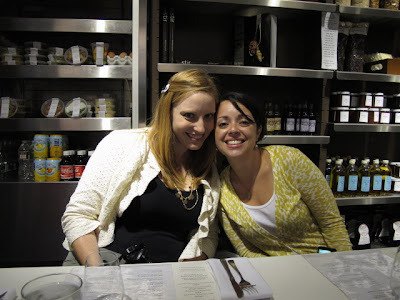 This is a recap of a fabulous night with some of my blogger buddies. When I first got on twitter and blogging last year, I "met" some Boston food bloggers and Jessie organized dinner to get everyone together to meet and talk food in person. We had a fun dinner at Cuchi Cuchi and kicked off new friendships! (You can check out a fuzzy photo of our evening via JQ Lounge). Fast forward to this summer and restaurant week. I have mixed feelings about restaurant week, some places do it great and some are like hanger steak factories. But with all the new restaurants around town, I decided that I wanted to give it a try. I saw Jessie tweet about restaurant week and quickly sent her a note. We both got busy creating our restaurant lists. The criteria: new to us and not a shellfish/pork heavy menu. We went through about 40 restaurants each and agreed on Sportello - Barbara Lynch's fancy-ish diner in the Fort Point Channel. With an attendee list of a few of my favorite bloggers, the evening was sure to be a blast! Nothing says summer restaurant week like a Nor'Easter! We all put on our rain boots and braved the elements to cross over the windy bridge to Sportello. Upon opening the door we were welcomed by the warm, comforting smell of browning butter. Really, is there a better smell? 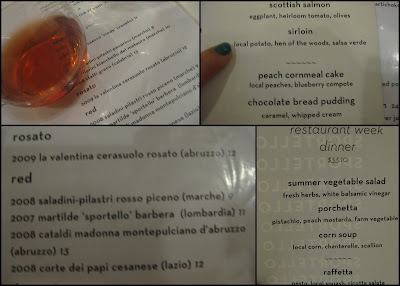 We started off with a bottle of Rosato and a toast to good food and friends. Then we got down to decisions. The menu was full of fresh, seasonal ingredients and each dish sounded mouthwatering. While we pondered the great choices, we were served whipped ricotta with olive oil and figs. The bread was sturdy, topped with sesame seeds, and had a wonderful buttery flavor. A nice touch was the amuse bouche sent out to us from the kitchen sent. Fresh pink salmon, horseradish crema, finely diced chives, and a mini green garnish! The first course was a unanimous choice by everyone - corn soup. It was lusciously smooth and rich. We asked our server if there was cream - she said no - just corn and olive oil which helped achieve that smooth velvety texture. We all cleaned our bowls, using the bread to get every last drop of soup, oil, and scallion. Here's what food bloggers do at dinner - Alicia from The Clean Plate Club documenting course one. To see the resulting picture, visit her blog. I could write a series on the steak entree during restaurant week. I always order it. Some places do it better than others, and this was one of the best. It was not until our server brought out the meal that I realized that she didn't ask how I'd like the steak prepared. I like that! The chef knows the meat, knows the dish, and I trust that they serve it at the optimal level doneness. It was pink in the middle, a little crispy on the outside. What I loved about all the courses was that the portion size was just right. I didn't feel like I was struggling to finish and I definitely didn't think that the portions were skimpy. And I really liked the plates...and glasses, and the whole vibe). The diner feel was cozy, comfortable, and I felt very much at home. In tribute to Alicia's blog - we were all members of the clean plate club! Dinner was delicious and we laughed off all the calories! Or, as Alicia wisely says, "Calories consumed with friends don't count." Words to live by! Thanks Katie for the photo of Alicia and Fiona and you and me! I love your new camera!! We all found a little more room for dessert. I opted for the chocolate bread pudding. It was served with caramel that tasted like it was poured straight from the pan onto the plate. It was buttery and just a little salty. It was the perfect accompaniment to the dark, almost bittersweet, chocolate bread pudding. I kept saying I was going to stop eating, but who was I kidding? It wouldn't be very nice to waste any food! I can't wait to head back down to try Sportello's regular menu, and stop downstairs for a cocktail at Drink. 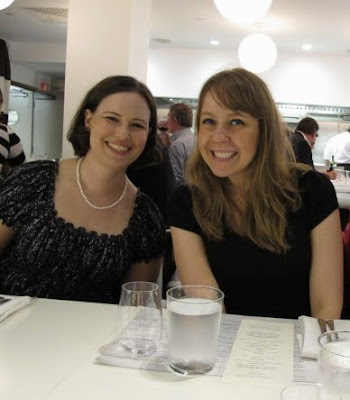 I am especially looking forward to seeing and meeting more blog friends in person! I don't have to tell you that I love farmers' markets. This year I've been lucky enough to have access to a local market almost all year round. In honor of Massachusetts Farmers Market week happening now (Sunday, August 22, through Saturday, August 28), here's a round-up of some of my favorite farmers market recipes and dishes. Enjoy! And, if you are inspired by the farmers market finds below, take a minute to visit the Mass Farmers Market website to find a market near you. 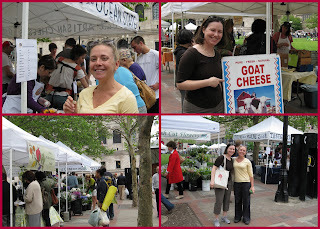 You can also donate to Mass Farmers Markets. The organization’s donation link is http://www.massfarmersmarkets.org/FMFM_Main.aspx. Thanks to In Our Grandmothers’ Kitchens for hosting this locally fabulous blogathon! I'll share my preference in my next post. Now on to the food! This salad features a wealth of ingredients from my go-to market vendors, Atlas Farms, Siena Farm, and the Herb Lyceum. A perfect way to show off the local bounty! This is my regular weekday market. I visit them either Tuesday or Friday every week from June - November. Since they stay open all the way until Thanksgiving I can stock up for all of the holidays. This is a recap of my first visit this season. You can also read about some of the fabulous vendors in my article on Local In Season. Don't miss Seta's Mediterranean Foods - her food is delicious and she is delightful. Here's an example of why I love being able to get produce year-round from local farmers. This is my first attempt at a homemade pumpkin/squash pie. After I tried this out, I stocked up on more squash for a Thanksgiving pie that I'm still drooling over and my relatives keep asking about. Read about that pie over at Local in Season. I challenge myself to buy a new-to-me item at the farmers market during each visit. It can be something I've never eaten, never cooked, or a new variety of an old favorite. Before this visit I had never cooked leeks. Inspired by the awful leek cooking on Top Chef, I decided I could definitely do better. On the train home on a regular commute, I found a bag of fresh local corn that someone had forgotten to take home. Sad for them, great for me! It was a great grilled side dish to burgers and a watermelon radish salad. These are my favorite muffins. And its also my favorite cake. Any shape you make it, these apple kugel muffins deliver great flavor. What puts them up in the flavor hall-of-fame is the combination of fresh local apples, almond extract, and cinnamon. Here's a delicious look at some of my regular purchases from the Copley Market. Sadly, the Nantucket Wild smoked fish vendor isn't there this year, but you can find them at the South End Open Market (SoWa) on Sundays. I am ahead a few Goat Cheese Picnic coupons if anyone wants to meet for lunch! 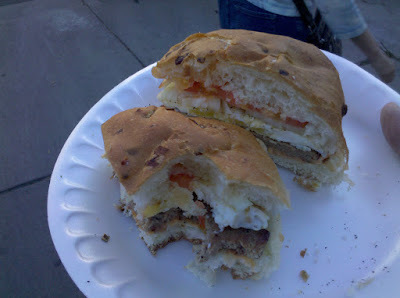 I could recap almost my entire blog in this post - there is a local food in almost everything. I hope this inspires you to get out and explore the wonderful resources in your area. Get to know your neighborhood and your farmers. I guarantee the food will taste better when you know where it comes from. I never thought I would ever say this, but Ted Turner has had a positive influence in my life. 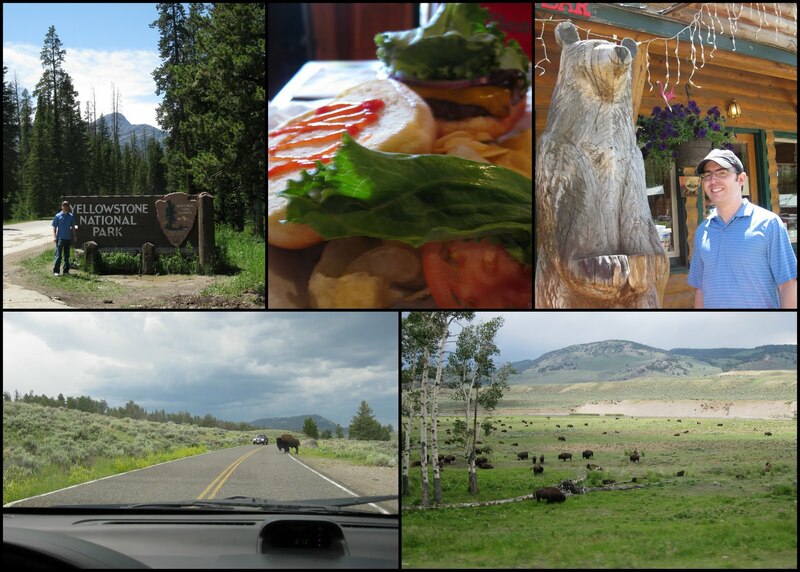 Ever since I went to Ted's Montana Grill ten years ago and had my first bison burger, I knew I had stumbled upon something I really liked. There is a Ted's nearby to us and we have gone a couple of times, but I make an effort to see what other bison burgers are being created out there. More often than not, if a bison burger is on the menu I'll order it. Such is my desire to get a good burger that I had a bison burger on the way to Yellowstone, where one of attractions I was most excited about was to see the Buffalo roam. The burger was delicious and I don't feel the least bit guilty about. The herds of buffalo in the park were pretty awesome also. But, what does this have to with lonely dinners? I don't know if you have noticed, but Whole Foods regularly stocks ground bison. When planning our meals for a particular week, the wife informed me that I was going to be on my own for a night. She told me this right in front of the meat counter, and because I don't really like to put too much thought into what I'm going to have for dinner 2 days in advance, and because the ground meat looked so good, I decided on the spot that I'd do bison burgers for when I fended for myself. I had a solid plan for quickly forming the burgers and getting them on the grill when I got home, but I decided to take a load off first. This lead to "resting" for an hour or two, and before I knew it the wife was on her way home, it was kind of late, and I missed my opportunity to make the burgers. Admittedly the cooking and execution of my lonely meals is probably biggest hurdle I need to overcome. I can be quite lazy. I mixed this all up by hand and then formed the 2 patties. In the meantime, the grill was preheating so I took the burgers out back and threw them on. When they looked done, I used our fancy spatula to scoop them up and plated them. I also grilled up some corn on the cob go to with it. It turned out to be a really quick dinner and looking back on it, I'm not sure why I couldn't do it the night before. A couple of weeks back I promised more healthy and complete dinners and I think this one is a step in the right direction. Hopefully it is something I can build on so you all can be impressed by the next "When He Fends for Himself"
I love the farmers market! I know, I say it a lot but it is so fun to see what's fresh, meet the vendors, and just be outside in the summer. When I saw that Olivia's Organics was calling for creative summer salad recipes, I knew exactly what I wanted to create. A Farmer's Market Bounty Salad. The ingredients would be whatever looked interesting at the market. For a base I used the Olivia's 50/50 blend. It's half spinach and half spring mix. 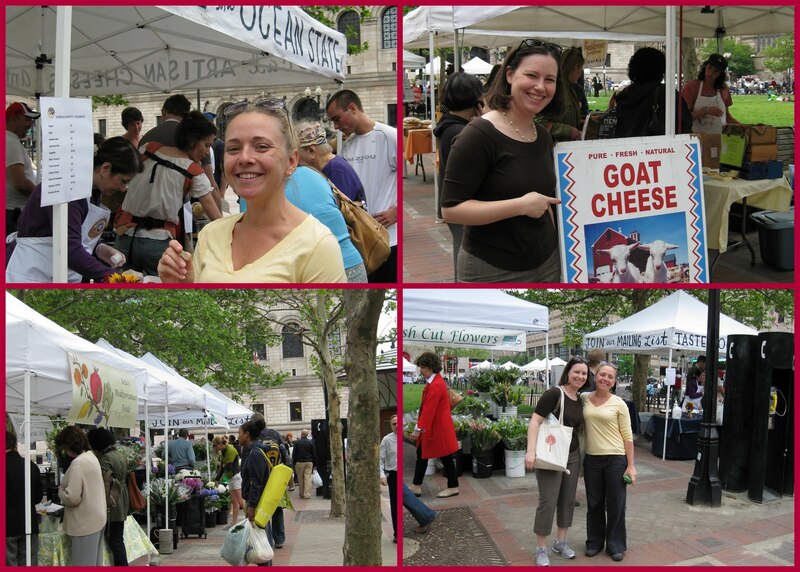 I headed out for a lunchtime trip to the Copley Square Farmers Market. Atlas Farms was my first stop, since I have my pre-paid share with them. I picked up most of the ingredients, then wandered over to Siena Farm to see if they had any new-to-me produce. These ingredients, combined with a few on hand from my weekend market visits, made for a good mix for the salad. I had all the ingredients waiting in the refrigerator, but had no free nights for dinner! So I did what any normal person would do (right?) and made my salad after coming home around 9:30 p.m. I did a photo shoot with the completed salad and then packed it up for lunch the next day! When I started thinking about a dressing for the salad, I kept coming back to something creamy. It needed to be light that wouldn't hide the flavor of all of the vegetables. I scoured the refrigerator and come up with Greek yogurt and lemon. I added in some of the parsley and extra virgin olive oil for a quick and healthy dressing. This was delicious, the Olivia's greens were a hearty base, and it was perfect for lunch and dinner for a few days! Place salad greens on a serving plate, top with veggies as neatly or sloppily as you'd like and serve! The August 2010 Daring Cooks‟ Challenge was hosted by LizG of Bits n‟ Bites and Anula of Anula‟s Kitchen. They chose to challenge Daring Cooks to make pierogie from scratch and an optional challenge to provide one filling that best represents their locale. My hubby really likes pierogies. When we first moved in together, he would buy the frozen Mrs. T's pierogies and make us the full box for dinner. Sometimes with butter, sometimes plain. I, on the other hand, wouldn't say that pierogies are my favorite. This challenge snuck up on me - we've been having a fun-filled and packed summer and pierogies weren't on my mind. So tonight I stopped by the store to pick up the ingredients - some potatoes and farmer's cheese for the filling. 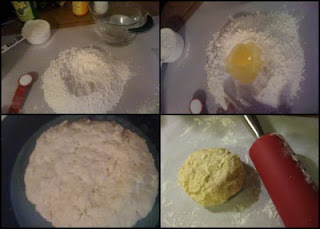 The dough wasn't too challenging to make - but I had some trouble rolling it out thin enough. I ended up with about five times more filling than I did pierogie shapes. Guess I'll be making more tomorrow! Or finding some way to use up a giant bowl of mashed potatoes and farmers cheese. For equipment I used a trusty pint glass to cut out the shapes and a fork for crimping. I boiled the pierogies in salted water and after about five minutes they floated to the top. 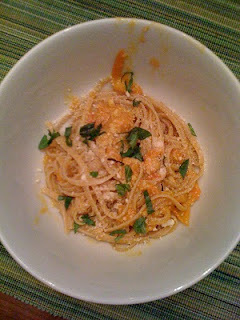 I served them with generous drizzle of olive oil and some fresh basil from my garden. The hubby really enjoyed them. I thought they tasted like the ones in the box, which I guess you could call success! 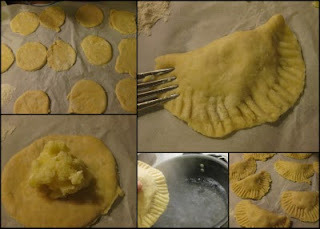 If I made them again I think I would try a sweet & sour cabbage filling or a dessert pierogie. I used the recipes provided for Russian Pierogies. I used the filling with potatoes and farmers cheese. I love pickles! My favorite foods are probably bread, cheese, pickles & olives, and guacamole. I could never leave any of those unfinished on the table. 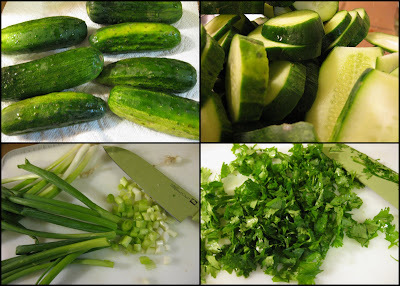 Lately there has been a lot of pickling going on in the food blogger world. I sent a few recipes over to my friend Renee and we decided to join in the fun. She went first – trying out the bread and butter pickle recipe from She’s Becoming Doughmesstic. Renee put her own twist in – adding in some garlic and a few extra spices. We tasted and decided that they needed more vinegar and less sugar for our taste. I tried next – swapping the quantities of vinegar and sugar and differing the amounts of scallions and cilantro. 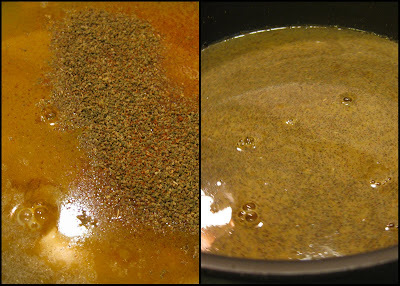 I also used ground mustard instead of mustard seeds. We tasted again and agreed that the less sweet pickles were more to our liking. Next up, Renee tried a more traditional dill pickle recipe with a recipe from Rachel at Loco Diner. These were good – but needed more time to cure. We couldn’t put our finger on what was missing, but they needed a little something else. 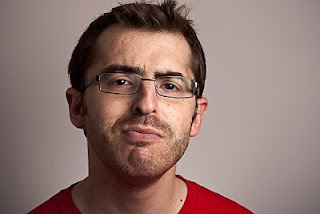 Maybe salt? Maybe more vinegar and less water? More spice? She’s working on that for the next batch. Now that we had basic pickling down, we decided that pickled onions were next. But instead of red onions I picked up 2 pounds of shallots. Aren’t mini-sized foods always cuter? (I know Meghan at Delicious Dishings would agree!). 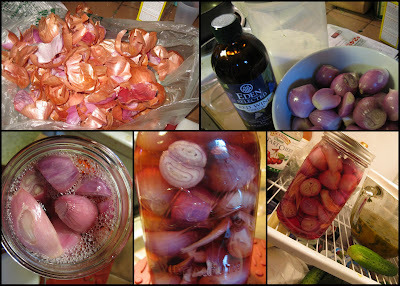 I adapted a recipe from Ad Hoc at Home and pickled a lot of shallots. Once I had a selection of each of the pickled items, I set up a pickle tasting for the hubby. I felt like we needed an official tasting for research purposes. For my pickles I used pickling cukes that I picked up at Charlton Orchards Farm and Winery at the Russell’s summer market. I decided to make a mix of chips and sandwich slices. I think that all the pickles were a success! The bread and butters were tangy and crunchy. The shallots were great as additions to brisket and chicken sandwiches. Now every day at work Renee and I talk about what else we can go home to pickle. Next on my pickle to do list is half sours. Half sours are my absolute favorite pickle. Do you have a recipe? Send it my way! Next on Renee’s pickle to do list is beet pickled onions. They are in the refrigerator pickling while I write this! What’s your favorite type of pickle? Dill, half sour, gherkin, bread and butter? Make sure to use black or stainless steel – this is a very yellow and staining mixture! Smoked brisket sandwich with pickles & shallots on a homemade biscuit! Pizza is a dish that lends itself to creative thinking. You can make it traditional, innovative, sweet, or savory. My favorite pizzas are light on sauce with a few great tasting toppings. Whenever I go home to St. Louis I try to get a St. Louis thin-crust pizza with hamburger and onion (sometimes black olives too). The best part of St. Louis pizza (and salads at the pizza places) is provel cheese. Provel cheese comes in ropes, it was created about 50 years ago for the purpose of topping St. Louis pizzas. It’s a combination of provolone, white cheddar, and Swiss. It melts well, doesn’t get stringy, and stays hot (watch out for burned mouths). When I’m here in Boston and thinking about pizza, I prefer to make it at home. It’s faster than delivery and we can make it exactly the way we like. Homemade pizza is also a great way to use up all those leftover ingredients in the fridge. We had picked up some premade pizza dough and the grocery store and set it out on the counter to warm up to room temperature. Like the start of most of my kitchen adventures, I looked in the fridge and pantry to see what we had on hand. From the freezer I pulled out at tin of Pestos with Panache’s Succulent Strawberry Pesto. I’ve enjoyed corresponding online with the pesto maker, Lauren, and had a chance to meet her in person at the SoWa Market earlier this summer. The strawberry pesto isn’t sweet – it’s a fabulous traditional pesto with the addition of bright red strawberries. To top of the pizza, I chose shredded Monterey jack cheese and a few golden delicious apples. This is a quick meal and perfect for a light dinner. You could also make the case for serving it at breakfast accompanied by some fluffy scrambled eggs and a cup of tea. Serve with a lightly dressed salad and try to save a few pieces for lunch the next day!